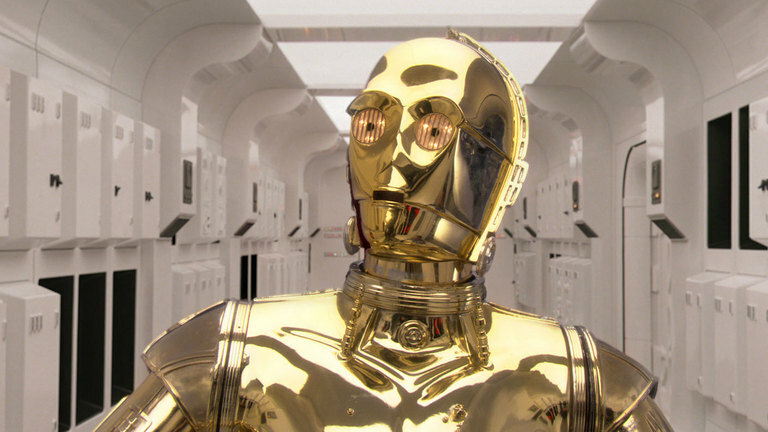 Did C-3PO’s Memory Really Need to Be Erased? A long time ago, when I was a small child in a small town, my father took me to see Star Wars shortly after it had opened in theaters across the country. As my father likes to tell it, I feel asleep about half way through. So, I don’t remember a lot about that showing or much about any of the showings I went to as a kid. One thing I do remember being captivated by was the droids. To this day, I’m not sure why that was. As a three and four-year-old in the late 1970s, I’m not sure I had any idea what a droid was supposed to be, but still, something about them captured my imagination. In fact, this was so much so that I remember when I had the opportunity to finally select my first two action figures, I picked out C-3PO and R2-D2. The action figures are long gone, but a soft spot for old Golden Rod was born way back then. It was years later when I was a young adult in a much larger metropolitan area that I got to experience The Phantom Menace. I knew C-3PO and Obi-Wan Kenobi were going to be in that film, and I had been wondering how they were going to get around the two not knowing each other in the original trilogy. Turns out, the pair didn’t share any scenes and C-3PO was left behind when the movie left Tatooine. Problem solved for then. Then Attack of the Clones arrived. Same issue, but similar solution. The old hermit of the original trilogy and C-3PO still didn’t share any meaningful scenes. C-3PO doesn’t appear until Anakin returns to Tatooine, and Obi-Wan is only ever present with C-3PO in the arena after C-3PO had his head swapped with a battle droid. Again, the issue had been avoided. Finally, Revenge of the Sith graced theater screens everywhere. Obi-Wan and C-3PO share screen time and exchange dialogue in this movie. After Obi-Wan defeated Anakin, C-3PO relays his distress over Padme’s condition to Obi-Wan before they depart Mustafar. They definitely knew who each other were. Something had to be done to resolve this plot problem, and Bail Organa had the solution by having C-3PO’s memory erased at the end of the movie. Problem solved. I remember leaving the theater thinking that was tidy, and that it made sense. C-3PO was a talker after all. He could spill the secret about the Skywalker children at any time. Bail Organa had seemingly inherited the droids if for no other reason than Yoda and Obi-Wan could not really use them on Dagobah or Tatooine respectively. However, the more I thought about it, the less satisfied I became with this solution. Could C-3PO really not be trusted with the secret of the birth of the Skywalker twins? For whatever reason, C-3PO has a reputation for not being trustworthy with secrets. Why? What major secret has he revealed? Do not forget, he was entrusted with and kept one of the biggest secrets of the entire Star Wars saga. He was present with R2-D2 for the marriage of Anakin and Padme. He didn’t tell anyone about that purposefully or accidentally. During the time of Revenge of the Sith, he was one of Padme’s closest assistants, and he undoubtedly knew the identity of her children’s father. Still, he didn’t reveal that information during her nine month pregnancy. If anything, C-3PO proved to be an incredible confidant. Alternatively, there is the justification that C-3PO could have been captured, and this information could have been extracted from his memory. This is a problem with droids, and it is one of the reasons given that their memories are erased from time-to-time. However, the same issue should have been a concern with R2-D2. In fact, during the Clone Wars, R2-D2 was frequently in more dangerous predicaments than his counterpart where the likelihood that he would have been captured was far greater. In fact, that very scenario was the plot of at least a few episodes of the Clone Wars series. Despite this, R2-D2 never had his memory erased. So, why then? Why did Bail Organa feel the need to erase C-3PO’s memory? Bail has always been portrayed as enlightened. Bail was looking out for the greater good. He saw the dangers of Palpatine’s accumulation of power in the Senate, and he took steps to curb that power. Ultimately, he was unsuccessful. In addition, one of his closest allies, Senator Amidala from Naboo, died in the process, but not before she had given birth to twin children, including a baby girl that he believed would be the perfect candidate for adoption by himself and his wife. Having made the decision to adopt Padme’s daughter as his own, did Bail become overly fearful? Was he more concerned with protecting the child he would raise as his daughter than he was about protecting the potential future of the Jedi and savior of the galaxy? It is hard to say exactly what his reason was for erasing C-3PO’s memory. Whatever it was, he didn’t lose any sleep over it. Whatever compassion Bail had, it apparently didn’t extend to droids. The next question is “why does any of this matter?” Droids are the inventions of their creators after all. They are property to be bought and sold. Jawas traded in them freely on Tatooine. Droids are designed to assist their owners in menial tasks, much like an oven or washer. They were frequently fitted with restraining bolts to keep them where they needed to be so that they wouldn’t run off. However, when that last statement is considered, they really aren’t so much like appliances. Why would a droid need a restraining bolt if it were just the same thing as the refrigerator? Droids exhibit many of the same emotions of sentient beings. The demonstrate self-preservation. Even mouse droids squeal and flee in the face of a threat. They feel anguish and loss. Recall how C-3PO reacted to R2-D2’s condition when he and Luke returned from the Battle of Yavin. They experience sadness. Remember what C-3PO said about R2-D2 while the astromech was in low power mode after Luke Skywalker disappeared in The Force Awakens? In short, they are an awful lot like human beings and other sentient beings in the galaxy. Therefore, it is my opinion that Bail Organa did not have much of a case to make for erasing C-3PO’s memory. By happenstance, Padme Amidala’s assistant was a droid. What if that assistant had been one of her handmaidens? What would Bail have done then? In the name of safety, Bail may have made a prudent move. However, his decision wasn’t a particularly enlightened one. Bail overreacted at best and acted out of jealousy at worst. C-3PO may not have been the most heroic character of the Clone Wars, but he was a loyal companion that deserved better than he got. Thanks for reading my debut blog at Coffee with Kenobi. Contact me at dkeithly@coffeewithkenobi.com or on Twitter @DJKver2. This article was absolutely fantastic! I never thought about how C-3PO kept the marriage a secret for so long. Thanks for reading, I really appreciated. It was that realization, and a few other things, for me that got me thinking about this topic. If at any point it was explained to C-3PO who Darth Vader was, he would have suffered the droid equivalent of a mental breakdown. He always seemed a lot more prone to emotional decision making than R2 was. His loyalty to the rebellion would have been tested and he probably would have done something dumb the first time he got to see Vader, like call him Annie or something.. It would have been a variation on that Robot Chicken skit where Jar Jar meets Vader, except not as silly.